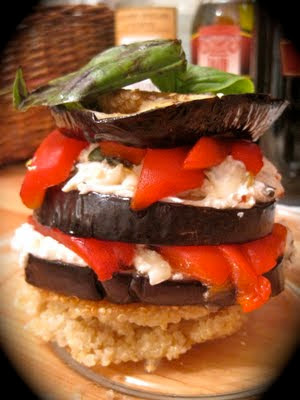 This stack of eggplant, cheese, roasted red pepper and quinoa tastes as beautiful as it looks. I paired two recipes: Eggplant Napoleons and Quinoa Cakes with Eggplant Tomato Ragu and Smoked Mozzarella for a twist on the classic eggplant stack: the quinoa cake adds a protein boost to the dish, plus a wonderful crunch at the bottom of the pile. As usual, I've scaled down the oil and substituted reduced-fat cheese to make a healthy, light summer dinner. Certainly impressive to a crowd, these Eggplant Napoleon with Quinoa Cakes are not too difficult to make, so I recommend hosting a dinner party to test them out. Enjoy! For the eggplant: Place a grill pan over medium-high heat, or preheat a gas or charcoal grill. * Drizzle the eggplant with olive oil and season with salt and pepper. Grill until tender, about 4 minutes each side. *I don't have a grill, so I roasted the eggplant in the oven on 450 degrees F for 10 minutes on each side before continuing with directions. For the filling: In a small bowl, mix together the ricotta/cottage cheese, basil, Pecorino Romano/Mozzarella, lemon zest, and lemon juice until smooth. Season with salt and pepper (and red pepper flakes if desired), to taste. To assemble: Place 4 slices eggplant on a work surface. Spread each with 2 to 3 tablespoons of the ricotta/cottage cheese mixture. Line 4 pieces of roasted red pepper, side-by-side, on top. Place another slice of eggplant on top and repeat the layers. Top each napoleon with a slice of eggplant and place on a small baking sheet. Bake until warmed through, about 10 minutes. Pour a generous serving of balsamic vinegar over the stack and serve over quinoa cake (recipe below). Note: If the eggplant slices dry out in the oven, drizzle with olive oil before serving. Heat 2 tablespoons oil in a 12-inch nonstick skillet over medium heat until it shimmers. Carefully add quinoa cakes and cook, turning once carefully, until crisp and golden, 8 to 10 minutes total (pat cakes to reshape with cleaned rubber spatula while cooking if necessary). Transfer to plates and serve Eggplant Napoleons on top. I am so excited to try this!!! Thank you Rachel!!!!! This looks delicious. I'll definitely be making it soon. Do you think it would work if I seasoned the quinoa cake at all?